Today I was really wanted something for dinner with goat cheese. Just one of those things, wanted it, had to have it. 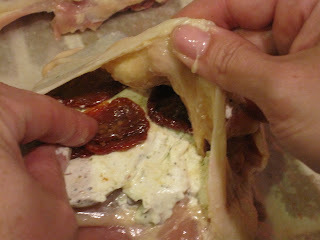 So, for dinner we had chicken breast stuffed with herb and garlic goat cheese, sun dried tomatoes and fresh basil. 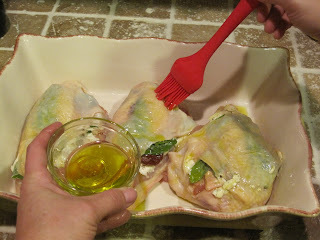 What you need: Chicken breast with the skin on, goat cheese (or any kind of cheese), sun dried tomatoes in oil, fresh basil and olive oil. Preheat oven to 375 degrees. 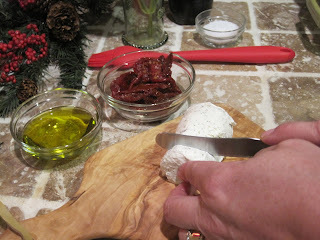 Slice goat cheese ( I buy the goat cheese with herb and garlic for this recipe). 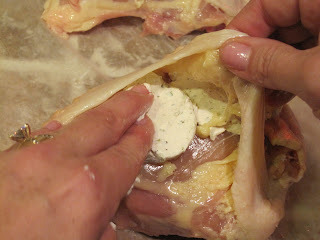 Lift chicken skin and stuff goat cheese in, add as much or as little as you like. I like making my spread evenly. 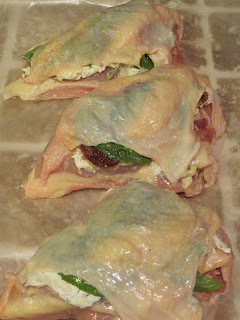 Stuff in the sun dried tomatoes next. 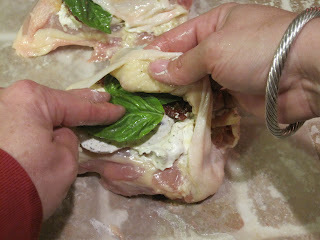 Basil is the final stuffing. 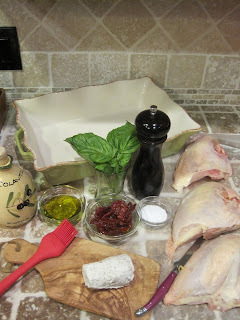 I have wax paper under the chicken, it's not just sitting on top of the counter. 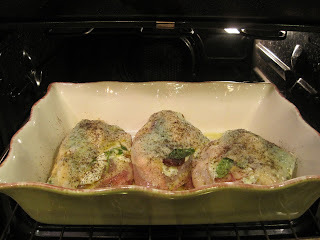 Place in oven, bake about 45 to 55 minutes. Can check with a meat thermometer to make sure the chicken has reached about 180 degrees. Now, the frustrating part, we ate it all before I remembered to take a picture of the finished results.